The Geneva agreement has been a failure and just as in February, events on the ground in the volatile country have overtaken the political efforts. After an initial burst of optimism that the diplomats might have negotiated a way out of the crisis, the great Geneva hope for peace in Ukraine is dead in the water. The agreement reached in Geneva between Ukraine, Russia, the US and the EU to create a process of de-escalation and to pull back from confrontation ended before it had a chance to begin, just like the compromise on February 21 between Ukraine’s President Viktor Yanukovych and the opposition. Just as in February, events on the ground have overtaken the political efforts. The shooting yesterday of Gennady Kernes, the mayor of Kharkiv, Ukraine’s second largest city, in an apparent assassination attempt, was the latest sign that the situation is unravelling rapidly in the east of the country. Armed pro-Russian separatists also seized control of another town, Konstantinovka, with shots fired at the main police station as the so-called “green men” in military uniforms, aided by locals, took control of the building. The seizure and detention of a group of military monitors from the Organisation for Security and Co-operation in Europe (OSCE) by rebels in the eastern city of Sloviansk has further increased international concern. The self-proclaimed “people’s mayor” of the city proposed yesterday to swap the men, four Germans, a Dane, a Czech and a Pole, for his supporters arrested by authorities in Kiev. Russia, an OSCE member, has called for the men to be released as soon as possible. Germany urged Moscow to use its influence with the pro-Russian separatists to secure the release of the monitors and “to distance itself clearly from such acts”. The US and the EU moved yesterday to impose another round of sanctions on Russia, accusing Moscow of failing to implement the Geneva agreement, further undermining the accord’s prospects. The US imposed visa bans and asset freezes on seven more Russian government officials, including two described as part of President Vladimir Putin’s inner circle. The list included Igor Sechin, a close Putin ally and former deputy prime minister who now heads the oil giant Rosneft; Vyacheslav Volodin, the presidential first deputy chief of staff in the Kremlin and Sergei Chemezov, head of the giant Russian Technologies Corporation who served in the KGB with Vladimir Putin in East Germany. The US sanctions also targeted 17 Russian companies with asset freezes and banned export licences for “any high-technology items that could contribute to Russia’s military capabilities”. An EU meeting in Brussels was expected to put another 15 Russian officials on its blacklist. Shortly after agreeing in Geneva to defuse the standoff with the south-east, the authorities in Kiev resumed an army operation in what they called a response to “terrorists” and foreign infiltration. Since Easter Sunday, several people, mostly civilians, have been killed in skirmishes and there have been many reports, some yet to be confirmed, of more clashes and casualties. Kiev and the West blamed Russia for the outbreak of hostilities, with President Barack Obama saying he had always been pessimistic that Russia would stick to what was agreed in Geneva. This scepticism was obvious even before the Geneva meeting, with US officials playing down expectations of a breakthrough or of Russian concessions meaningful enough to avoid a third wave of American and European sanctions. Yet the Geneva outcome was hailed by all sides as far better than appeared possible. •All sides must refrain from any violence, intimidation or provocative actions. The participants strongly condemned all expressions of extremism, racism and anti-Semitism. •All illegal armed groups must be disarmed; all illegally seized buildings must be returned to their legitimate owners; all illegally occupied streets, squares and other public places in Ukrainian cities and towns must be vacated. •Amnesty will be granted to those who have left buildings and other public places and surrendered weapons. •The constitutional process will be inclusive, transparent and accountable. It will include the immediate establishment of a broad national dialogue, with outreach to all of Ukraine’s regions and political constituencies. It is evident that steps towards national dialogue had to be taken by the Ukrainians themselves, while the international community was expected to be “assisting Ukrainian authorities and local communities in the immediate implementation of these de-escalation measures”. However, US Secretary of State John Kerry made it clear Washington would hold Moscow responsible for controlling the pro-Russian protesters in the south-east, and having them leave government buildings and disarm. But there was a problem – they were not represented at Geneva and refused to abide by its agreements. Moscow tried to persuade Kiev, Washington and Brussels to invite the supporters of regional autonomy to Geneva, but failed. This was seen as a diplomatic victory for Kiev, but it turned out to be an own goal. The need for compromise is especially poignant at a time when the world remembers the historic meeting on the Elbe between Soviet and American troops that brought the end of the Second World War one significant step closer. On the 65th anniversary of this meeting, on April 25, 2010, Russia’s then President Dmitry Medvedev issued a joint statement with President Obama paying tribute to “the courage of those who fought together to liberate Europe from fascism”. The spirit of the Elbe was supposed to be kept alive with the help of the “reset button” that was presented to Foreign Minister Sergey Lavrov by the then Secretary of State Hillary Clinton. But the mistranslation of the word “reset” into the Russian for “overload” proved ominous for the initiative. If Russia felt misled by the West on Libya, she was bound to feel more anxious about the unfolding crisis in Ukraine. Russia’s security concerns appear to be the key to unlocking the promise of the Geneva accords. Since 1991, Russia has been trying to persuade Nato to agree to a new, all-inclusive security arrangement covering the whole of Europe and all the way to the Pacific. What she saw instead was a relentless expansion of Nato towards its borders. Moscow hoped a breakthrough in solving its security concerns had been reached with the formation of the Nato-Russia council in 2002, designed to assure an “all-weather” resilient dialogue, even when relations were tense. The failure to make progress after the Geneva talks does not bode well for the holding of presidential elections in Ukraine on May 25. 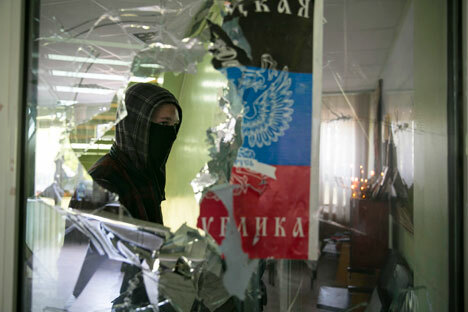 Separatists in the eastern Donetsk region are also still intent on holding an independence referendum on May 11. Whether the West and Russia like it or not, they need each other to tackle challenges far bigger than Ukraine. One Western leader who had his own brush with Moscow over a major international crisis 10 years ago, in Iraq, has urged a “wilfully blind West” to understand its long-term interests in countering Islamic extremism and to make common cause if necessary with Russia and China on the issue. The spirit of the Elbe calls for a bold step towards each other to secure this peaceful co-existence, be it in Ukraine or the wider world.